Nicky passed as a result of injuries received from a car colliding with his bicycle 5 days ago on the Rimini coastline in Italy. Last edited by Sebastionbear; 05-22-2017 at 11:48 AM. I'm devastated. There are no words. I loved the way he raced, but I looked up to him because of how he handled himself off the bike. Such a hard worker, so humble, and never threw anyone else under the bus. I'm surprised that there wasn't even a mention of him on the nightly news. 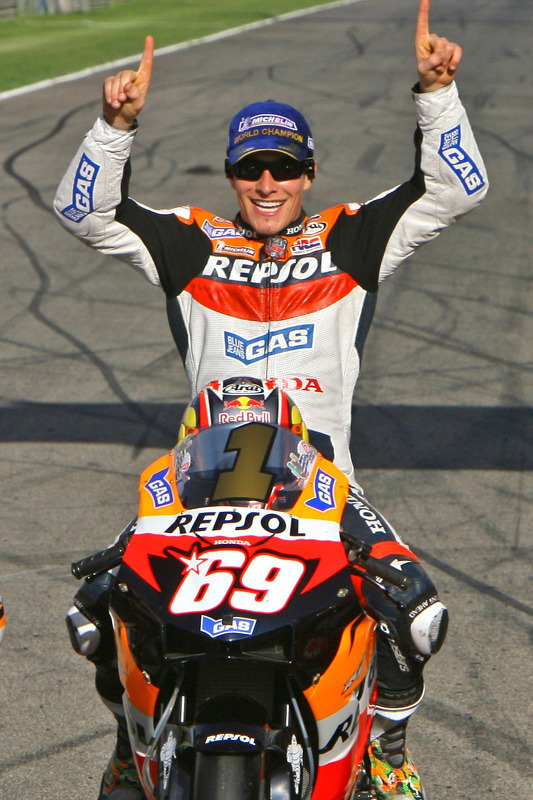 I mean he was the champion of the pinnacle of motorcycle racing, the 500 GP in 2006. And that was the last time that an American had that title. "Later, at age 17, he was racing factory Honda RC45 superbikes while still in high school. In 1999, he won the AMA Supersport championship on board a privateer Honda." We were talking about how cool that would be to be to be a pro motorcycle racer and winning the championship--while in high school! Much respect to a legend, a star, a top ace. A true champion on AND off the track. Dam. I am absolutely gutted at this news. I sold my bike a few years back as I have a young family and other things sorta took priority, but I had to log back in here to comment. As I said. I am absolutely gutted. I was so hopeful for good news to happen of some sort of recovery. I can remember watching him from AMA through MotoGP and WSBK. I remember like it was yesterday of him taking his victory lap with the American flag and the amount of emotion that was present during that lap. One of the most amazing people to ever ride a motorcycle. So talented, so humble, and just an all around great guy. He will be missed by so many people. My heart goes out to his family and friends that knew him personally. If a guy that I only watched can make this impression on me, I can only image the void that is now with those that were close to him. "Nicky my brother, our story wasn't suppose to end like this. You were world champ for a reason. I've never met someone with the desire for racing bikes like you. "I remember growing up we shared a room and you studying notes you took from the previous race and we were 12-13 years old, I'll never forget the Monday morning after you won the world championship, you woke me up to go running. That's what separated you from the rest and made you a legend. "I could go on. You made everyone here better, cause when you wasn't here, we were riding or cycling to close the gap for when we road with you again. You pushed me to my best, but more importantly I'll remember what kind of brother you were. "You were a legend of a racer and a brother. You were there for me no matter what was going on in life. You wanted to help, I'm glad you were able to see me at my best these past couple years, not just on the bike, but mainly off it. "I can sit here and ask why all day, but instead I want to be thankful for having a brother like you for 33 years. Don't worry I got the nieces handled. No boyfriends till they're in college and I'll teach the nephews what it takes to be a champion in whatever they decide. "This picture (below) is special to me, because after some bad luck and it looked like your world title was over, I grabbed you like this and told you it was still your year, and that was the first thing you did to me when I saw you at the podium. Tell me it back. "Even during this incredibly difficult time I still have my faith, I believe if god will bring you to it, he will bring you through it. Till we ride again I love you. #letsgetit #69"
2007 VERY LIMITED 1000RR Repsol Nicky Hayden Edition! MotoGP Update***Interview with Nicky Hayden!! !